Natural wonders like tumbling waterfalls, jutting rock faces and banks of wildflowers have long drawn visitors to America’s national parks and inspired efforts to protect their beauty. According to a UVM-led study published Sept. 4 in Park Science, visitors also value and want to protect a different kind of threatened natural resource in the parks: dark nighttime skies. The study’s lead author is Robert Manning, Steven Rubenstein Professor of Environment and Natural Resources in UVM’s Rubenstein School. According to the study, 99 percent of the world’s skies suffer from light pollution and two-thirds of Americans can’t see the Milky Way from their homes. Most light threatening the National Parks comes from development, the study says. Light from cities or towns can reach parks from as far away as 250 miles. 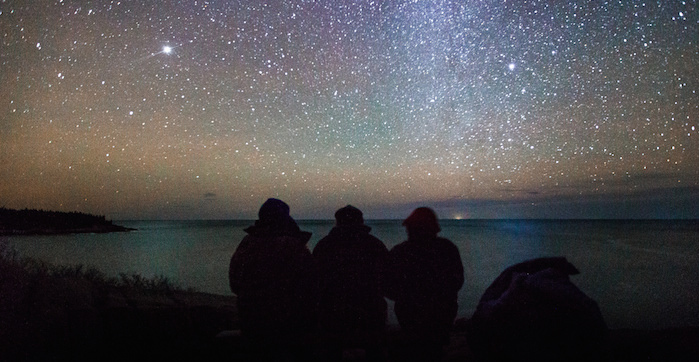 In addition to gauging the value to park visitors of a dark nighttime sky, the study also provides data to park managers at Acadia – and by extension, other parks – enabling them to develop visitor-driven plans for setting light pollution targets. Reducing light pollution requires an effort targeted both inside and outside the park, Manning said. Visitors should minimize light use, avoiding the use of headlights, flashlights and other sources of illumination as much as possible. Most light pollution derives from older style light sources that disperse illumination horizontally rather than directionally toward the target area. Converting to LEDs and other directional lighting will enable parks and neighboring communities to dramatically reduce light pollution in the parks. The growing popularity of astronomical tourism provides a financial incentive for towns and cities neighboring parks to reduce light pollution and should be encouraged. Two parks have been especially successful in reducing light pollution, the study says: Acadia, which worked with the neighboring city of Bar Harbor to implement a progressive lighting ordinance, and Chaco Culture National Historical Park in New Mexico, which partnered with stakeholder groups to successfully encourage the state legislature to pass the New Mexico Night Sky Protection Act.